Up there with the best Price aside a superb rum very well balanced, smooth and long lasting. I love it with a wonderful cohiba. One of the 2 best rums I ever tasted. Luscious Sweetness!!! Full body, subtle sweet, soft oak very classy. One of my favorites. Delicious Sweet candied caramel with cinnamon spices. Very smooth with a long finish. Up there with the very best, got the last bottle! Great Siper Nice balance, great sipper. Coconut, caramel & coffee. Great value. Almost a 9! 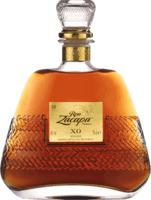 Wonderful vanilla and caramel, I get a craving for it at times over other higher rated rums. Terrific. It's really an 8.5 Deep color smooth tasty sweet rich but forgettable compared to others on same price/rating. Nice Balanced But Smooth nice sherry rum lacks that caramel sweetness I enjoy but worth the money. Long lasting well balanced! Nice and soft Smooth molasses, honey and vanilla. Nice finish but forgettable.